The Well Ain't Dry Yet from Amazon.com, Barnes & Noble or from Mountain State Press. Teacher Jason Lilly has written a series of Literature Analysis Notes for The Well Ain't Dry Yet for use in classrooms. 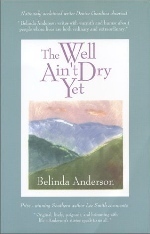 If you are a teacher who would like to use The Well Ain't Dry Yet in a classroom setting, contact Belinda Anderson at WritingWV@aol.com. If you feel a little guilty after reading The Well Ain't Dry Yet, you were probably raised to believe eavesdropping is impolite. Sure, eavesdropping on the lives of fictional characters may not seem such a crime—after all, we do it all the time with books, TV, films, etc. But there's something about the characters and settings of Belinda Anderson's collection of eighteen short stories that just might fool your conscience. We know these characters as people before even turning the first page. They are our friends, our enemies, our neighbors, our relatives and sometimes even ourselves. We wouldn't be surprised to find them in line with us at the grocery store or sitting two pews down from us at church. And like any community, Anderson's characters pass through one another's lives (stories) just as easily as the people they remind us of pass through our own. For instance, if you don't currently have a cranky, troublesome neighbor like Mr. Wood from the story Rainbow Ranch, you either have before or one day will and can take a tip on how to deal with him now. Or if you haven't yet been run off the road by a de facto member of the crazy old lady drivers club, who meet monthly in Delivery, count yourself lucky and keep both eyes on the road when driving near the Princeton Cracker Barrel. And though you probably haven’t driven around for years with your dead sister’s ashes taking up space in your trunk, you can probably sympathize with the long-standing jealousy leading the main character of Hauling Evelyn to do so. Some of Anderson's tales take on a dark subtext, such as Marital Bliss, or infuriate you at the pure selfishness of people, as the story Junior does. Ultimately, though, even these stories remain hopeful that a better day is just around the corner. The Well Ain’t Dry Yet is a cross-section of life as we know it in West Virginia. Anderson's characters feel as though they were living their lives before we opened the book and will go on living them after we've closed it again. She’s merely allowed us to eavesdrop on them for a little while, with perhaps a little guilt for having done so. This is Anderson’s true accomplishment. Twilight Dawn sits at the quilt frame in her living room, creating something whole from the scraps people bring of their lives. She opens The Well Ain't Dry Yet, then steps aside to allow her customers to come forward and tell their own stories. They sneak in and out of each other's tales, bound by the quilter and a mysterious old man in a Jaguar. Suzy hauls her sister's ashes in the trunk of her car. Randall attempts to hang onto his job and tries equally hard to avoid adopting a ragged stray cat. Margaret dreads a class reunion—with good reason. Thomas discovers that, indeed, the well ain't dry yet. "Universal themes resonate in Belinda Anderson's accomplished stories. Her strong characters linger in the mind — characters such as African-American quilt maker Twilight Dawn Johnson, who can put together the pieces of people's lives in a way that makes sense and meaning for them, or the harassed divorcee who can't quit hauling her dead sister's ashes around in the car until she can come to terms with her own jealousy and shortcomings. Original, lively, poignant, and brimming with life—Anderson's stories speak to us all" — Lee Smith. 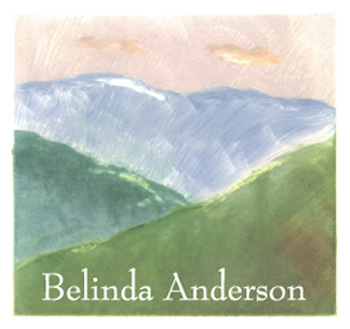 "Belinda Anderson's characters and settings are clearly Appalachian-West Virginian. Her stories demonstrate, however, that even in the isolation and deprivation that some of her people experience, human beings sufer and celebrate in common. Her characters are individualized and their problems elicit recognition and empathy. This is a book both readable and enlightening." — Barbara Smith.